Electric utilities worldwide share a key objective: to provide secure, efficient, and sustainable energy. This is more important than ever as their customers’ energy needs grow in tandem with the pressure to cut fossil fuel dependency and reduce greenhouse gas emissions. Smart grid solutions that help facilitate the use of renewable energy play an important role in meeting these challenges. Regions like Australia, which has the highest average solar radiation per square mile of any continent in the world, are taking advantage of their abundant natural resources. As an example, Australian utilities and their customers are investing in solar panels as they seek more affordable, secure, and sustainable power. Solar power generation grew by 23 percent in 2014-15 and the majority of this came from the over two million homes in Australia that have rooftop solar systems. Smart grid technological advancements allow for higher levels of renewable penetration into the grid and are improving the grid’s efficiency, resilience, and energy security. For instance, by implementing load leveling and voltage management technologies utilities gain flexibility and can anticipate and better manage peaks in energy demand. This is crucial because this massive influx of distributed energy resources (DER) is having a major impact on grid operations and is changing the pattern of energy consumption, aka the load curve. The greater the presence and diversity of DER connected to the grid, the greater the need for distributed energy resource management solutions (DERMS) to manage the complexity. DERMS solutions communicate with both utility and customer-owned DER for monitoring and control capabilities to plan for, coordinate between, and optimize distribution grid assets. Providing situational awareness and serving as a network analysis engine, they enable distribution operators to predict, respond to and manage voltage and load fluctuations, reverse power flows and various other complications DER introduce. And microgrids, for example, connect to the grid but can also disconnect and run in “island” mode. Microgrids can maximize the use of renewable resources, such as solar and energy storage, while at the same time receive value from and offer value to the grid in the form of added reliability and resiliency. A microgrid management system integrated with DERMS gives utilities the ability to optimize grids within grids and provide more secure and sustainable network operations. Whether it’s solar power in Australia, wind power in Denmark, or hydropower in China, countries are learning how to harness their natural resources to supply green energy. 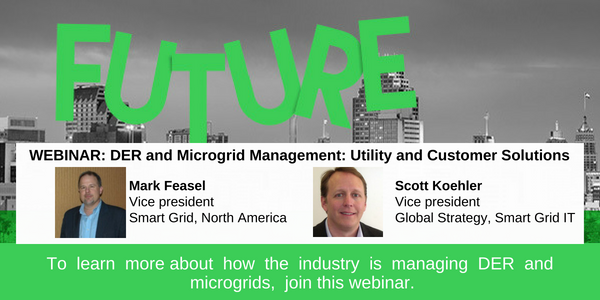 To learn more about how the industry is managing Distributed Energy Resources (DER) and microgrids with customer-sited solutions and utility DER Management Systems (DERMS), watch our dedicated webinar, presented by Scott Koehler and Mark Feasel on Tuesday. Watch on demand now.